Nice catch of snappers and bonitos on our drift fishing trip. Great action this week on the Fort Lauderdale reef. Bonitos, a gamefish species of tuna (non-edible) are solid on our reefs right now as they are embarking on their annual migration down our coastline. Bonitos are in the tuna family and are one of the strongest fish pound for pound in the ocean. Every summer, hundreds of thousands of bonitos make their way northward along our reefs, feeding on the plenitude of small baitfishes. 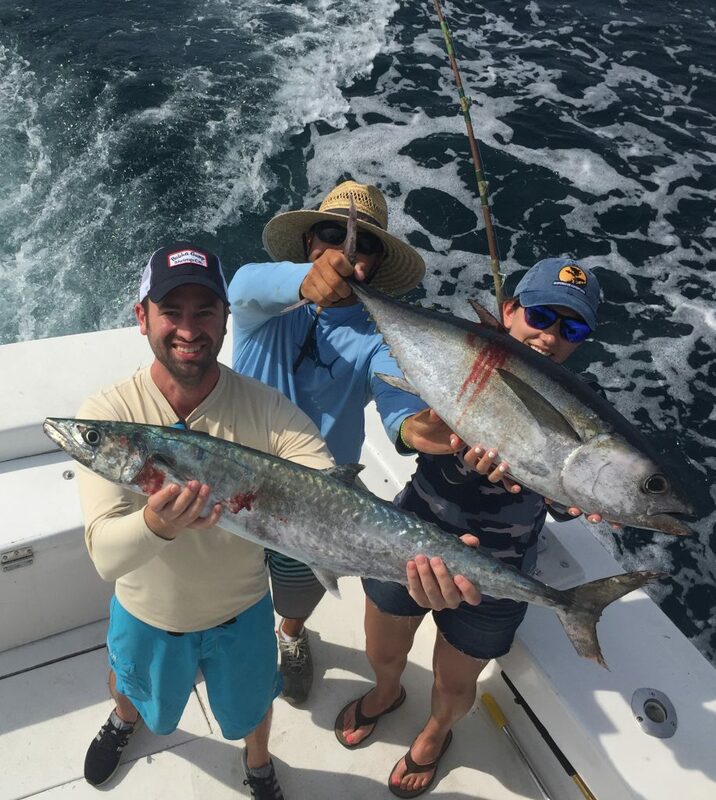 This annual event gets the action on our reefs HOT and creates the best fishing season for general action in south Florida. Lots of other pelagic fish species migrate among the bonitos, taking full advantage of the school’s protection and hunting advantages. Our drift fishing trips are getting into the snappers, bonitos and kingfish pretty good. Afternoon trips have been slightly better than the mornings as the low pressure of the afternoon passing showers gets the fish biting. 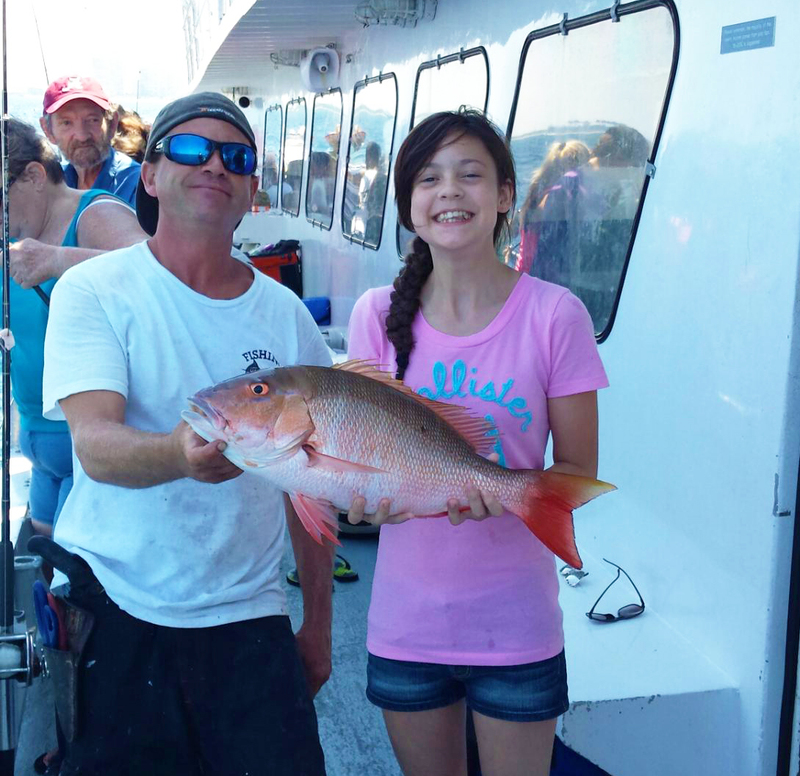 Mangrove and mutton snappers are biting extremely well this week. Maybe it is just a fluke, but better than average numbers of the bigger snappers are being caught on our drift boat this week. For bigger game fishermen, instead of the standard bottom fishing rig, ask the mate to rig you up with the kingfish rig. This rig is a 3 hook rig where each sequential hook is hooked into the eye of the next and all hooks are put into a larger, whole bait. This is a good rig for catching kingfish, bonito, blackfin tuna, barracuda and even a possible wahoo. While you won’t get much action on this rig, at least not as much action as fishing the bottom rig, it gives you the chance to catch a larger pelagic fish. Some guys call this rig the ‘hero or zero’ rig. Nice bonito caught on our sportfish trip. Bonitos get all the activity on the reef going this time of year. 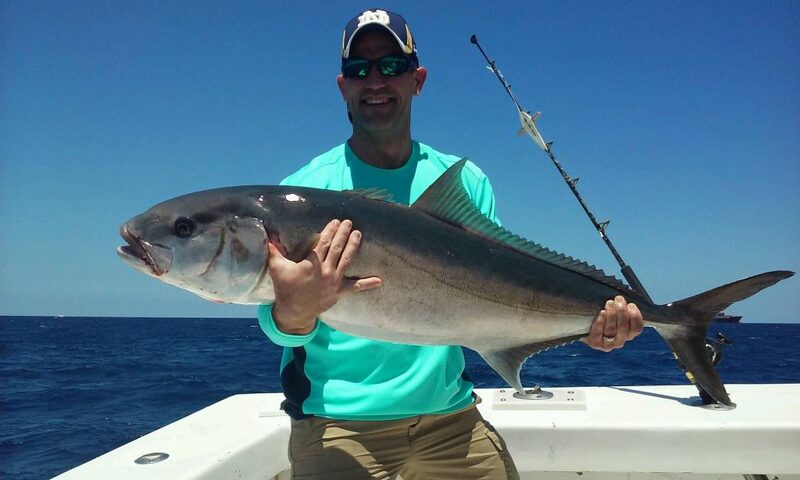 Sportfishing action is red hot in Fort Lauderdale this week. Trolling is the all around best technique for catching fish on the reef. 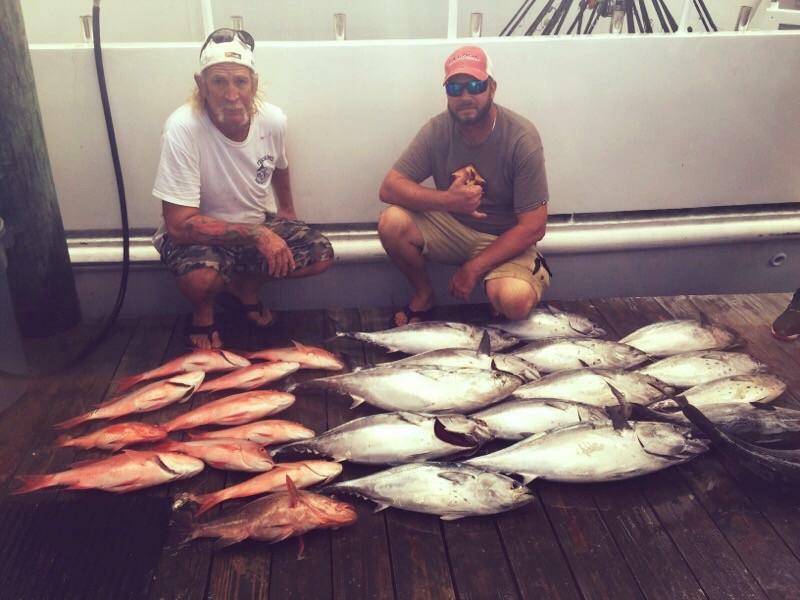 With the plethora of fish on our reefs this month, the fishing action is off-the-chain. Bonitos are making up the majority of our catch. They are biting the best and they are the most aggressive, so we catch them the most. Bonitos average 10-20 pounds and are one of the strongest fighting fish in the ocean, even on heavy tackle. Second in line for numbers of fish are kingfish, which are fairly abundant on the reefs this month. Kingfish are a great eating fish if you are able to eat them fresh. Kingfish average from 5-20 pounds and the smaller ones make for the best eating. 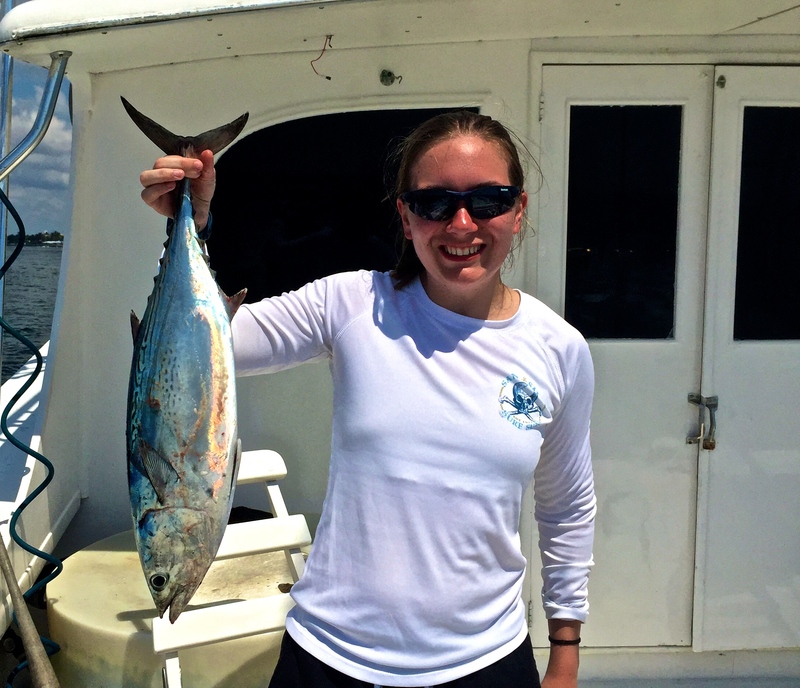 Blackfin tunas are also abundant on our reefs this month. Most of the blackfin tunas are smaller fish, about the size of a football. They do sometimes get big, all the way up to 30+ pounds. Tunas are so good eating you can even eat them raw! Wahoo are a longshot possibility this month. We catch them when we are trolling the reefs and catching bonitos. When you’re wiring in your fish and you think you’ve hooked into another big bonito, up pops a monster wahoo. They always bite when you least expect it. Don’t forget if you catch one, to shout at the top of your lungs, “Waaahooooo!”. Offshore the dolphin are biting, but they are sporadic. You have to go looking for them and put in your miles. Even then, it’s not a sure thing to find them. Dolphin typically bite between 4-6 miles offshore, but can be as far offshore at 10-15 miles out on some days. You just have to go out looking for them and hope you find something good to fish along such as a weedline, birds, floating debris, or something. It’s a big ocean offshore and luck is a much larger percentage than skill when it comes to dolphin fishing. Even with trolling a full day offshore, success isn’t guaranteed with dolphin. But you can also find a school of fish in your first 15 minutes of fishing and load your entire fishbox from that one school. Dolphin will generally eat just about anything you throw at them so, it’s all boat meets fish when fishing for dolphin offshore of Fort Lauderdale. Nice mutton snapper caught this fisher gal on our drift fishing trip. With the sheer amount of fish we’re catching on the reefs of Fort Lauderdale, there’s not much reason to try anything other than drift fishing or trolling. As my dad always told me, “Never leave fish to go try to find fish”. Good luck to everyone fishing off Fort Lauderdale this week. I’ll sea ya on the water. 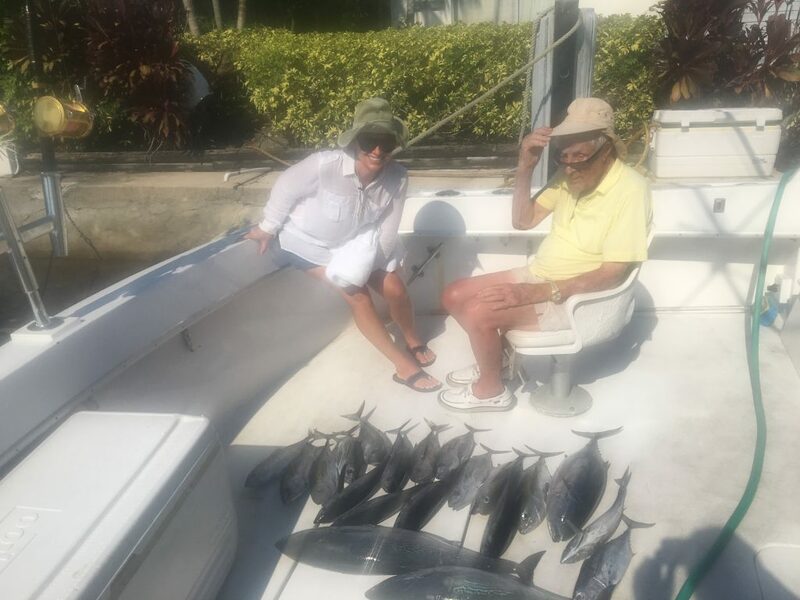 Nice catch with lots of tunas on a sportfishing trip out of Ft Lauderdale. Nice black grouper caught deep dropping on a shipwreck during our sportfishing charter. 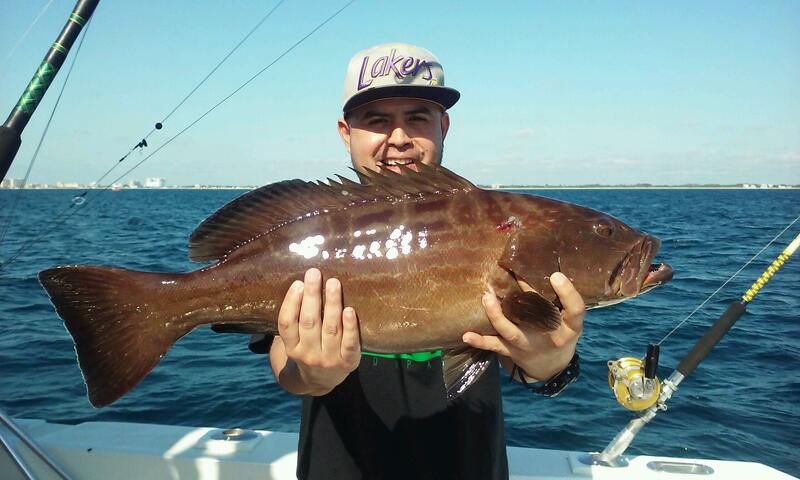 The Fort Lauderdale reefs and wrecks are holding some nice fish this week. First off, the wrecks are working great. In years past, Fort Lauderdale was involved in the Artificial Reef Program and sank dozens of large, retired vessels to make good habitat for fish. Shallow spots were great for divers, creating a fun location to dive and view fish. Deeper wrecks in the 200-300ft range, made good spots for fishermen to target deep dwelling bottom fish. We’ve perfected our technique for fishing shipwrecks. Using live baits, we can target a specific structure (like a big sunken shipwreck) to go after big game fish. We drop a single live bait to the bottom and allow the current to carry our boat and bait over, along and past the sunken structure. This is a fast, efficient way to go after amberjacks, almaco jacks, several species of large groupers and cobia. We catch other species at times too such as barracuda, sharks and snapper. Wreck fishing is a great technique this time of year to catch some of the biggest and hardest fighting fish available in our waters. 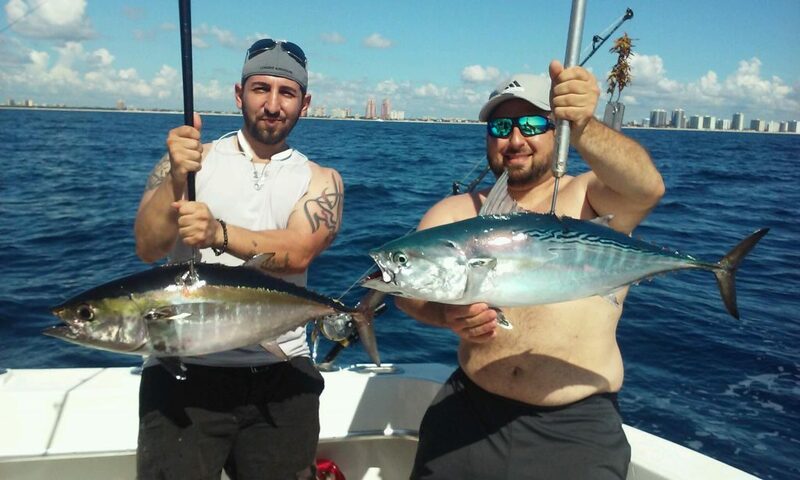 Nice blackfin tuna and bonito caught fishing the Fort Lauderdale reef. Reefs are beginning to hold a lot of fish. Tunas are scattered all over the reefs these days. Most of them are smaller tunas, football size on average, but there is no size limit on tunas and they are numerous. A few larger blackfin tunas are also mixed into these same tuna schools so you never know how big of a tuna you might catch when trolling the reef. Kingfish are biting stronger and stronger everyday. Summertime is kingfish season here in south Florida. It’s not the time for the lonely smoker kingfish but rather the time for lots of medium sized ones. The best bet to target kingfish is trolling the reefs, covering as much ground as you can, and sticking to whatever depth or zone is giving you the best action. The depth/area of greatest concentration of kingfish is generally where the best concentration of all the other fish too. Bonitos are starting to show up. In another month, they will be so solid on the reef that you can walk on them. Bonitos will hang right in there with the kingfish and tunas. Wahoo, although less common, are also a possibility when trolling the reef, which is the best method to target wahoo as well. Basically, the action on the reef in the summer is as hot as the weather. There’s good variety on both the reefs and wrecks this month. If you’re after mahi-mahi, you have a chance to catch them if you go offshore and look for them. They can be hard to find and we come back skunked sometimes if we put all our eggs into one basket and head offshore for the long shot. Mahi-mahi are around this month but they are hit or miss. You have to put in your time looking for them and then you have to get lucky and actually find them. For dedicated anglers that are solely after mahi-mahi, they are exciting and awesome to find. It’s just with so much action on the reefs and wrecks, its hard to leave high percentage fish to go try to look for low percentage fish. For those willing to go for the gusto, it does sometimes pay off. A few good dolphin catches have been caught this week. 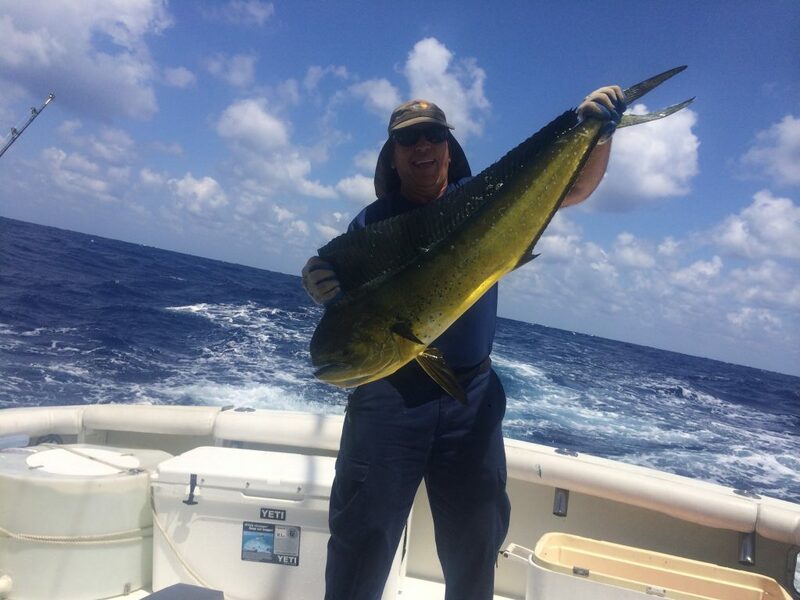 Lucky angler with a nice mahi-mahi caught on an offshore sportfishing charter. 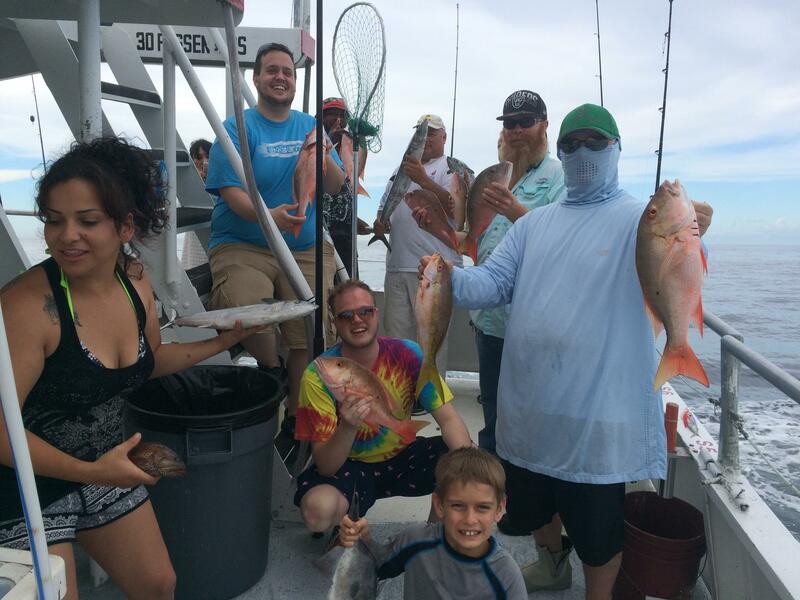 There are fish biting in Ft Lauderdale on all our different fishing trips. Drift fishing trips are a fun, inexpensive way to get out on the water and go after snappers, groupers, jacks and other small bottom fish. Sportfishing charters sacrifice action in order to catch larger size gamefish and trophy sharks. Our 8 hour shared charter gives us a lot of time to try a variety of different fishing techniques which can lead to a diverse catch of many different species (some really big ones). This is a GREAT month to go fishing in south Florida. Good luck to all the anglers fishing with us this week. I’ll sea ya on the water. Someone is eating mahi for dinner tonight. 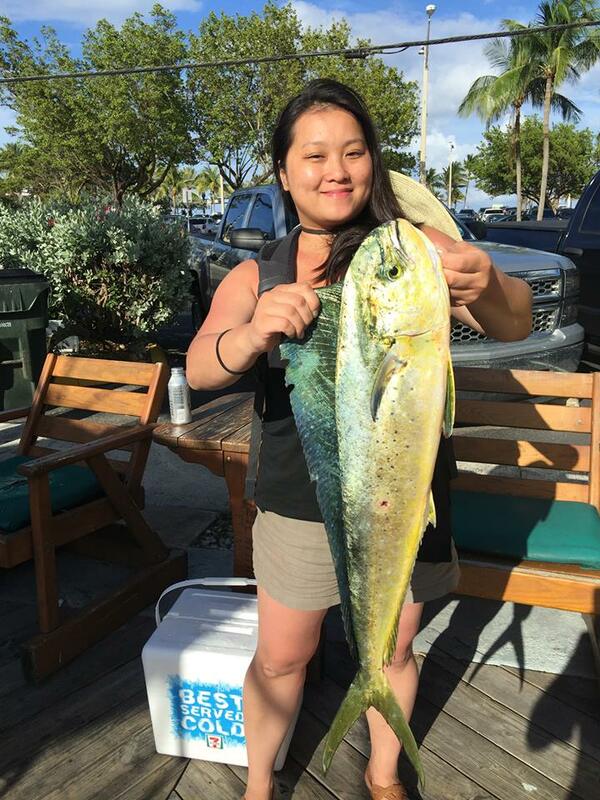 Nice mahi catch on our sportfish charter. 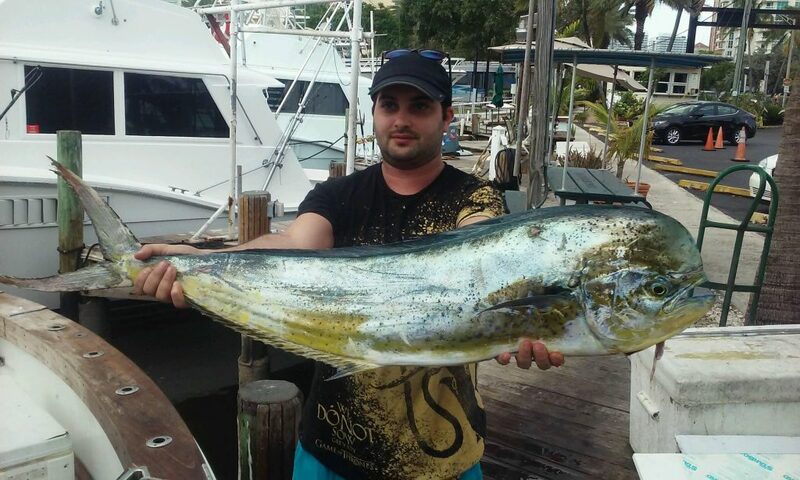 Big dolphin caught on our sportfishing charter in Fort Lauderdale. 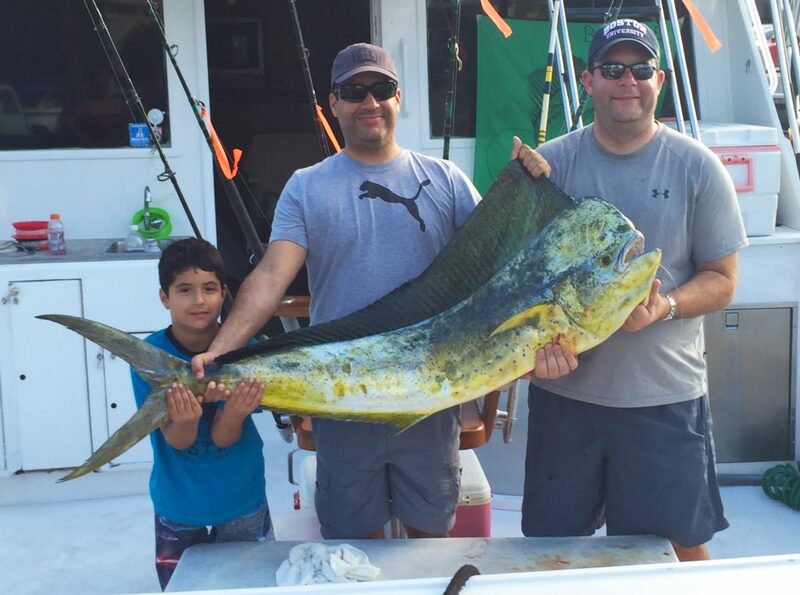 Some big fish were caught this week fishing the waters of Fort Lauderdale. A few lucky anglers caught big mahi-mahi on some of our charters. This is the last good month we have of good mahi-mahi fishing for a few months. They aren’t biting as well as they were in April where you could find them without even looking, but they are still out there and they can be found. Sometimes in June, the dolphins form up into massive schools of fish offshore. It might take 6 hours of trolling to find them, but when you do, it’s like finding a pot of gold at the end of the rainbow. Of you can troll for hundreds of miles without finding a fish. Offshore dolphin fishing is like roaming a desert and finding a school of dolphin is like finding an oasis in the middle of that desert. 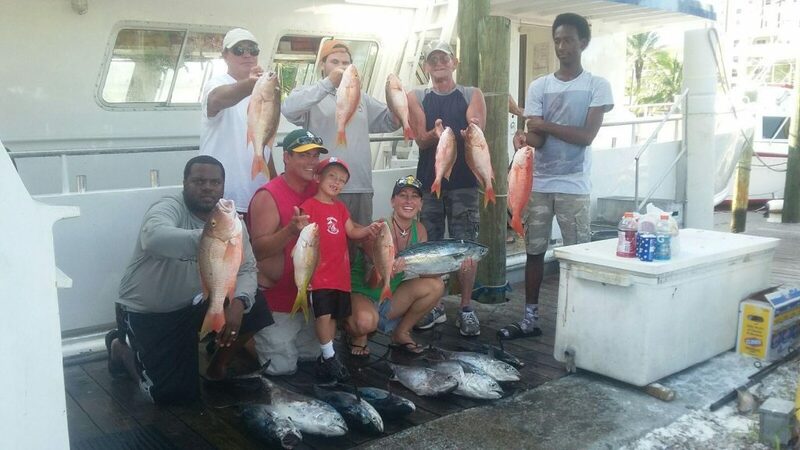 For dolphin, you have to put in your time so for the best bet, try our 8hr All Day Fishing Trip. The best bet these days for good fishing action is trolling the reef. Trolling the reefs you can catch kingfish, blackfin tuna, bonito, barracuda and more. If you’re really lucky, you might hit a wahoo or even a rare sailfish. Trolling the reef is effective because you can troll over and cover a lot of ground. If you find a depth or zone that is producing fish, you can ‘work the area’ leading to even more action. This can lead to a boxful of fish if the fish are being cooperative. June through September is reef trolling season in Fort Lauderdale and the action gets really hot. Nice catch of snappers on our afternoon drift fishing trip in Ft Lauderdale. Drift fishing on the reefs is great fun too. June through September is when our drift fishing boat really shines. First off, there is surface and mid-depth action. This is the time of year you can go out on the drift boat and actually have a good chance at catching a big kingfish or blackfin tuna. Ask the deckhand to rig you with the “hero or zero” rig, not the standard bottom rig in order to catch these upper water column, larger fish. This rig gives you a good chance at catching something big, but lessens your chances at catching anything at all. So for most anglers, I recommend the bottom fishing rig to go after snappers… and June is one fine month for snapper fishing in Fort Lauderdale. Mangrove and mutton snappers spawn on and around the nights of the full moons in June through September. They get really aggressive and and throw caution to the wind to bulk up for spawning. We catch them better during these months than throughout the entire rest of the year. Snappers bite best later in the day so I recommend the afternoon drift trip or the night anchor trip for the best success. On drift fishing trips, we catch the full spectrum of bottom fish from grunts and porkfish to sharks and groupers. The action on the bottom is pretty good. Most of these fish are pan sized, but almost all are good eating. Groupers are a possibility and they sometimes get big! 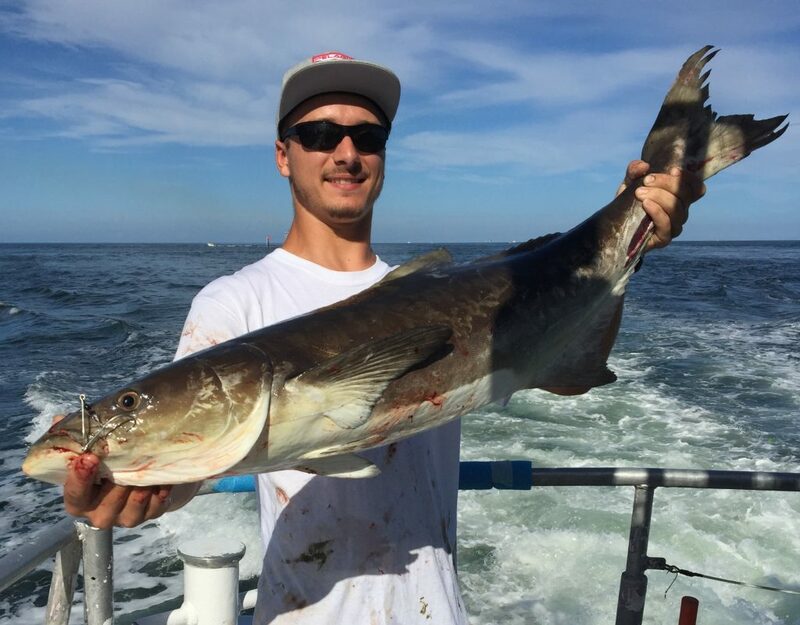 Cobia are another big fish that frequently bites on our drift fishing trips. There are always a few around, they follow sea turtles around and other slow moving sea creatures. They bite sporadically when you least expect it, but this is a good time of year when there are more of them around, so you always have a chance. There’s a good variety of good fish biting on all our trips this month. Good luck to everyone fishing south Florida this week. I’ll sea ya on the water. 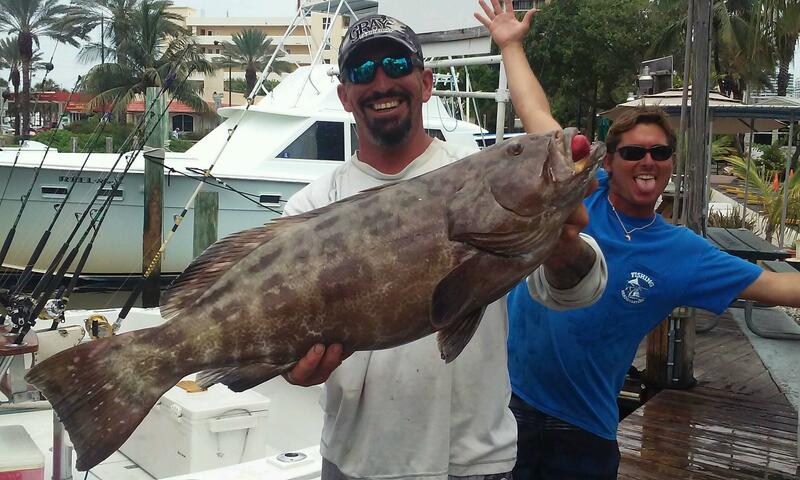 Nice black grouper caught deep dropping in Ft Lauderdale.